Looking for a solution for your unorganized mess of papers? Check out this lateral file from the Edge Water collection. It features two drawers with full extension slides to hold letter or legal size hanging files. It also includes a patented, interlocking safety mechanism that allows only one drawer to open at a time. Finished in a classy Estate Black, this lateral file will get the job done and look good while doing it. 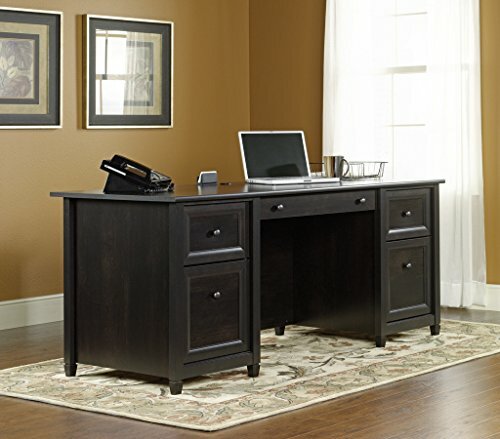 Large drawer/shelf with metal runners and safety stops features flip-down panel for keyboard/mouse. Two file drawers with full extension slides hold letter-size hanging files. Two small drawers with metal runners and safety stops. Desk top has grommet hole for electrical cord access.